We all need some extra support at some point in our lives. It could be in the midst of a difficult transition, like a stressful move, the loss of someone important to you, or during your search for a new job that will fill your life with meaning. Maybe you are trying to find your way as a new parent, navigating a difficult health diagnosis, or struggling with your relationship. Maybe you just feel like you’re in a rut. This is your one life to live, and you want to live it to your fullest, but something is keeping you stuck. When we feel like we need some guidance and a safe place to process what’s going on, therapy is a great place to start. 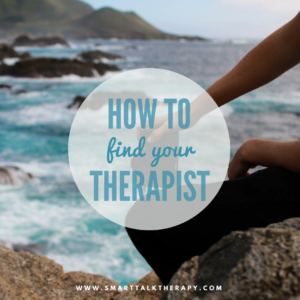 One of the major roadblocks to starting therapy can be finding the therapist who is going to be right for YOU. So, where do you even begin? A great place to start is with a little research. Do you have a friend or family member who has or had a therapist that they found helpful? Ask for a referral. If you are not sure you know anyone who has seen a therapist, you can start your research online. Psychology Today is a website that lists therapists in your area, their specialties, and also has some information written by the therapist about who they often work with and what kind of work they do. It also helps to browse therapy websites. You can learn about services offered, the therapist’s background, and read their blog, which can allow you to get a feel for the therapist through their online presence. Many therapists and practices also now have professional social media accounts where they may share quotes, blog posts, and resources. Ask yourself "is the information from the therapist resonating with me? Do I feel like the therapist is speaking directly to me through what they write and share?" If the answer is yes, then that therapist may be a great fit for you. Reach out! Many people know fairly quickly once they are in the office with the therapist whether they will vibe well together. Check in with yourself. Acknowledge that therapy itself can be intimidating since you are about to dive into some vulnerable topics, and it will not always feel comfortable to talk about and explore painful or hidden emotions. Knowing this, do you feel comfortable and safe here, both physically and emotionally? Does the therapist put you at ease? Do you feel this is someone with whom you feel you could open up? If you know this quickly, fantastic! It sounds like you may have found your therapist. If you are thinking, “I might be able to open up to this therapist, but I need some more time to make sure I feel comfortable and safe here,” that’s completely normal, too. Take your time, and allow yourself to go at your own pace as you explore whether this is the right therapist for you. Not every therapist is going to be the best match for every person, and that is not only okay, it is expected! If you gave it a shot with a therapist and it just didn’t feel right in the room, feel free to let the therapist know. They will likely respond with understanding and compassion, and they may have some referrals for you for a therapist who might be a better fit based on what kind of support or therapist you are seeking. Not everyone finds the right therapist for them on the first (or second!) try, and it is okay to keep looking until you find a therapist who you feel can help you and with whom you feel comfortable. After all, that is what therapy is all about! Online therapy is becoming more and more popular as our cultural involvement with technology grows by leaps and bounds each day. In this day and age, we are busy! You may not have the time to drive across town, park, and spend 50-60 minutes in a therapy session. Maybe your job keeps you super busy, or you are juggling young kids with a million different activties and schedule needs. Online therapy may be a great fit for you. At Smart Talk, we offer 30-minute sessions where you can talk to your therapist using your smartphone or computer from the comfort of home- or really anywhere you have internet! Schedule sessions during your lunch break, in the evenings, or when the kids are napping. This flexibility may be what you need in order to make therapy work for you, and many great therapists are offering online therapy options. If this sounds like it may work well for your life, schedule a session with a therapist using online therapy and see if this might be a great fit you. Finding the right therapist can seem impossible, but these strategies can help you navigate this process. A safe place to talk about your problems and process your emotions can enhance your life in ways you never thought possible, and with the right therapist for you, you will be on the road to living your best life before you know it! An impressive share, I simply given this onto a colleague who was doing a little evaluation on this. And he in truth purchased me breakfast as a result of I discovered it for him.. smile. So let me reword that: Thnx for the treat! However yeah Thnkx for spending the time to discuss this, I really feel strongly about it and love reading more on this topic. If doable, as you grow to be experience, would you mind updating your weblog with more particulars? It is extremely useful for me. Huge thumb up for this weblog post!